With just over a month to go until Europe Day on Monday, 9 May things are really picking up on the Blue Star Programme! We love hearing from schools about how you’re planning to mark this important day and hope to visit as many schools as physically possible! 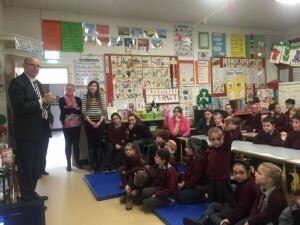 Ambassadors and MEPs have been busy visiting schools up and down the country in recent weeks. School visits are a great opportunity to showcase pupils’ work as part of the Blue Star Programme and for pupils to learn about the EU in a practical, hands-on way. 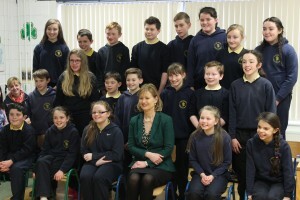 Thomas Kluck of the Dutch Embassy visiting Dromleigh NS, Cork. 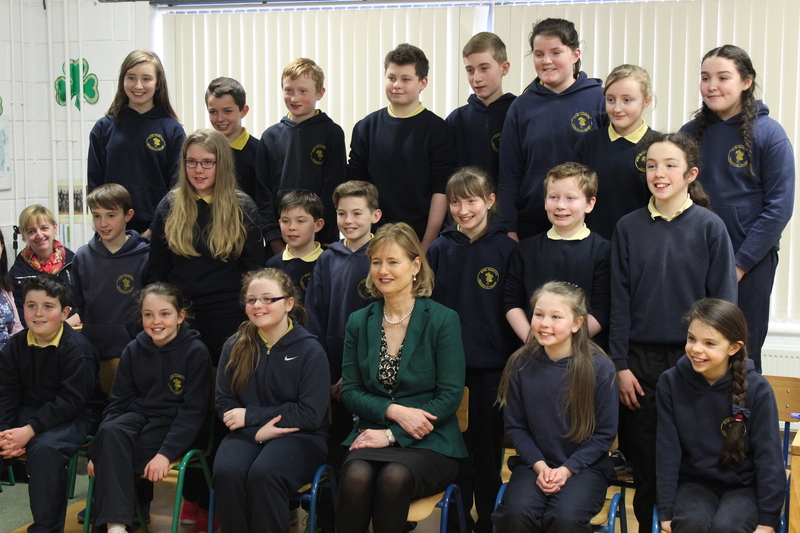 Deirdre Clune visiting Cullen NS, Cork. Europe Day on Monday, 9 May is the culmination of the Blue Star Programme every year and is always a great day! In the past we’ve seen food fairs, parades in local communities, school Eurovision competitions, art exhibitions inspired by famous European artists, flag days, parents’ days and lots in between. Europe Day is an excellent opportunity to showcase your school’s work and activities as part of the Blue Star Programme – to pupils, their families and the wider community. Why not write to your local MEP or invite one of the EU Ambassadors to visit your school as part of your Europe Day celebrations? MEPs and Ambassadors love getting involved in the Blue Star Programme and seeing how pupils around the country are learning about the work of the EU, so don’t hesitate to reach out. We also ask pupils and teachers to mark Europe Day with a ‘Handshake for Europe’ which sees pupils and teachers shake hands with each other to recognise the solidarity that exists among European citizens and to celebrate the diversity that comes with being part of the EU. Please do get in touch with us and let us know what you are planning for Europe Day! It is a fantastic opportunity to display your hard work and we will be more than happy to help you with the organisation and promotion of your events. 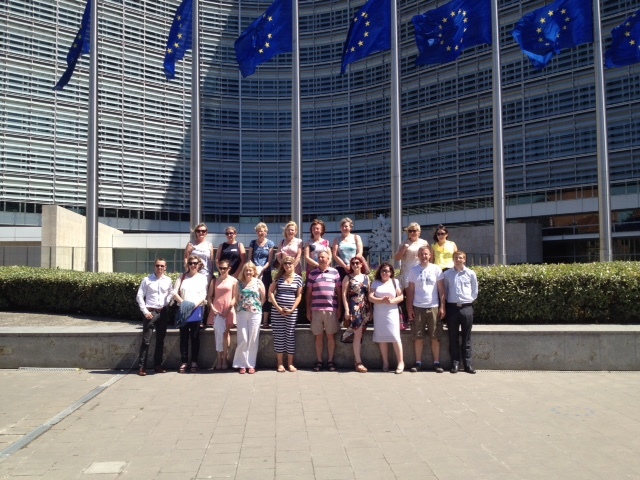 We are delighted to announce that will be organising a trip to Brussels for participating Blue Star Teachers in July. The trip will take place from Monday, 11 July to Wednesday, 13 July (flights to and from Brussels will be via Dublin Airport). The trip will include visits to both the European Commission and European Parliament in Brussels and we are hoping to confirm a visit to the Irish Permanent Representation as well shortly. The European Commission will kindly cover the cost of return flights, hotel accommodation (single occupancy, breakfast included) and airport transfers in Brussels for all participants. Only teachers who have not travelled to Brussels before as part of the Blue Star Programme are eligible to take part in this visit and there is also a limit of one teacher per school. If you would like to join us on this trip, please confirm your participation by emailing bluestar@europeanmovement.ie. The deadline for signing up is next Wednesday, 13 April. There are limited spaces on this trip and it is decided on a ‘first come, first served’ basis so if you are interested, please contact us as soon as possible. The next and final phase of the Blue Star Programme is the Final Reports. The conclusion of this Report is required for you to officially complete the Programme and attain your certs in June. In it, the Report will ask you to give an overview of what you and your pupils did for the Programme under each of the five headings (Historical, Geographical, Cultural & Creative, Institutional, Europe Day). The Report is laid out similarly to your Action Plan with an extra section which asks you for your feedback on the Programme and for suggestions as to how we could improve the Programme next year. We also ask you to include any photos that you may have of your pupils taking part in the Blue Star Programme and in particular any images you may have from your Europe Day celebrations. All Blue Star Reports are to be returned to us via email to bluestar@europeanmovement.ie. The deadline for submission of your Report is Friday, 20 May but we are happy to receive these reports before this date, just as long as you have already held your Europe Day celebrations. Here is the link to the document you will need: http://www.bluestarprogramme.ie/resources/. Seán Kelly MEP is one of many great supporters of the Blue Star Programme. Last year, he nominated the Blue Star teachers for the European Citizens’ Prize – which they jointly won for the work the Programme has done in introducing teachers, pupils, parents and the wider community to the EU, what it means and how it works. Seán has kindly organised a briefing session on the Blue Star Programme which will take place in Mary Immaculate College this Friday, 8 April from 12pm to 2.30pm. For further information about this event or to register your attendance, contact seankellymep@gmail.com. We would like to give one quick special mention to Kildare Town Educate Together NS who have put in great work into hosting their own Blue Star awards, showcasing their cultural learning and fantastic creativity. Here is a link to their website for you all to enjoy: http://www.kildaretownet.ie/blue-star-awards/. If you would like any more information on the topics above or any other aspect of the Blue Star Programme, feel free to get in contact with us and we’ll be more than happy to advise you. Until then, best of luck with all your work and we look forward to hearing from you soon!